The princess is sad and lonely, now that her mother has been carted away by the police. You know what would cheer her up? Various suitors throwing themselves at her feet, working with all their might, using whatever means necessary, to get their missives to her (while at the same time thwarting their rivals’). The people closest to the princess, who know her best, are more likely to persuade her that your letter is the one worth receiving. But can you persuade the persuaders without giving yourself away? Love Letter is a light deduction game for two to four players set in the world of AEG’s Tempest series of games. The goal of the game is to win the most number of rounds, either by being the last player in the round or by holding the highest card when the deck runs out. 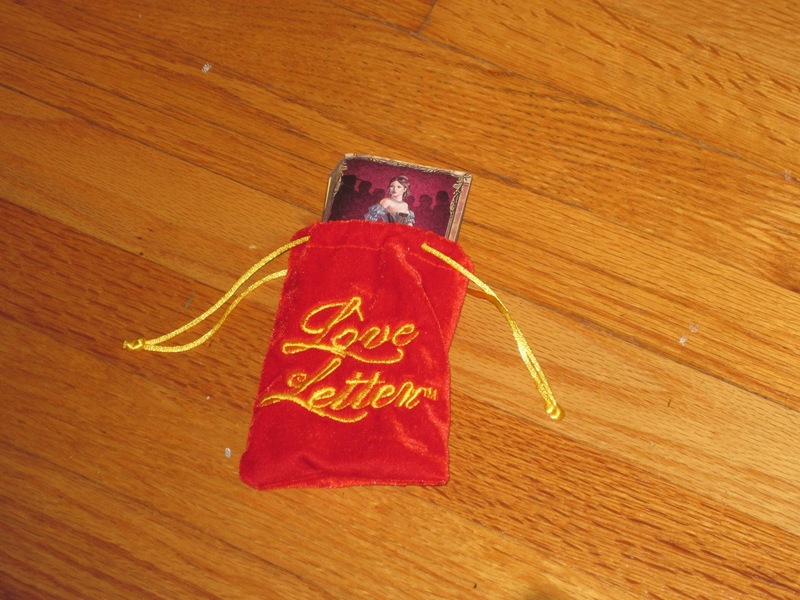 Love Letter contains a sixteen-card deck, with cards valued 1-8. Each player is dealt one card at the start of the game, and players take turns drawing one card and playing one card. The catch is that most cards have a special effect when they are discarded (and some have passive effects listed on the card). 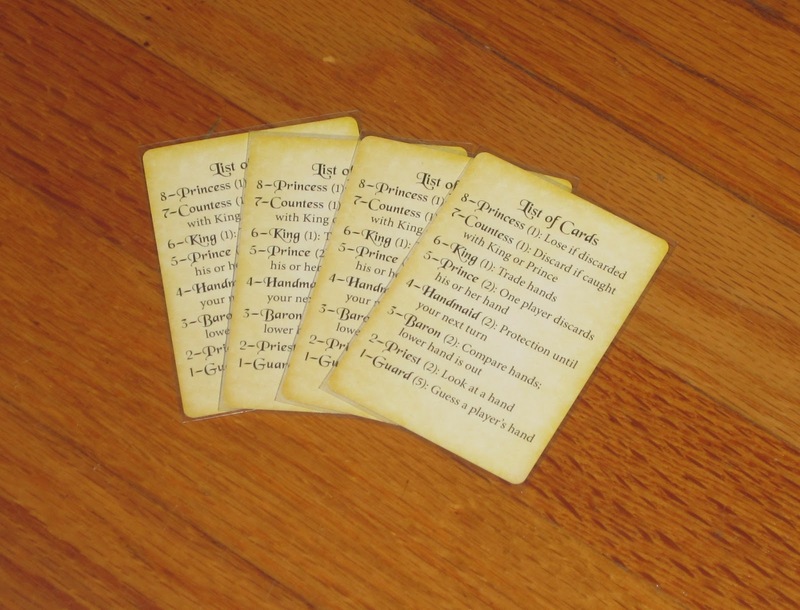 For example, the lowest card–the guard (1)–can choose a player and name a non-guard card. If that player holds that card in their hand, that player is out of the round. A player automatically loses if he discards the princess (8). And so on. A round ends when either the deck runs out of cards to draw or all players but one have been eliminated. The player holding the highest card wins a token of affection, and rounds continue until one player receives a predetermined number of tokens. That player wins the game. Love Letter, or Junk Mail? I am well disposed toward small-box games, so much so that Wolfie has taken to calling them “Lennys” in my honor. I love games that are quick, compact, and easy to teach because they allow players to get right in the action without having to go through the sometimes grueling rules-learning process for a game they might never play again. Granted, small-box games have their place, and they’re not always (or even often) my first choice of games to play, but I have a soft spot for them all the same. So despite my expectation to fall in love with it, Love Letter left me with cold feet. Love Letter has some things going for it. It’s a small-box game, which means that it can be taken, set up, and played nearly anywhere. 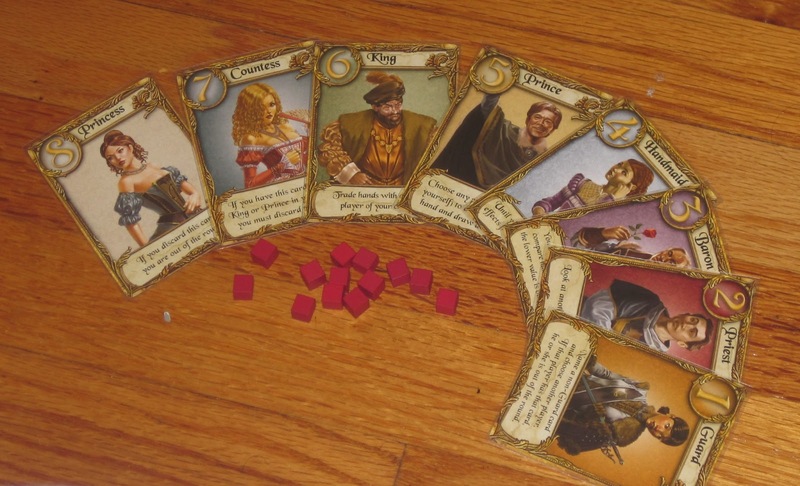 In fact, the game is so simple and low on components that you probably don’t even need a table, or to be seated at all. The simple rules match its compact nature–easy to teach and grasp, with new players jumping in almost instantly. The artwork is nice, and the rules booklet, while a bit long for a game of this nature, is comprehensive and full of flavor. Love Letter can, with the right group, also lend itself to funny in-game banter, making it almost a social game if the players allow it. The game comes with round markers (“tokens of affection”) if you want to track wins over multiple rounds, and the velvety bag, though fairly cheap feeling, is a nice touch in setting the mood for the game. The cast of Love Letter and those ever-so-necessary tokens of affection. But there are several things that made me not care for Love Letter. First, and most important, is the lack of meaningful decisions in the game. Each turn is comprised of drawing one card and playing one card. With only two cards to choose from, there is usually (if not always) an optimal move to make. If you’re holding the princess (who causes a player to lose if discarded) and a guard, you’ll obviously discard the guard. That’s an extreme example, but the entire game feels like this decision over and over. I could try to be sneaky, maybe, and bluff the card in my hand, but chances are an opponent will find a way to eliminate me before my bluff has time to pay off anyway. And if you think too long about your decision, players will probably be able to discern what you’re holding regardless. The main defense of Love Letter fans against the meaningful decisions criticism is, “Hey, it’s sixteen cards! What do you expect?” Yet these defenders are usually the same ones touting the novelty of the game: “Look! A game with only sixteen cards! Isn’t it great!” An arbitrary restriction is not in itself worthy of praise (though some arbitrary restrictions, like making a game with only fifty numbered cards, pay off). A twin concern with Love Letter is the luck involved. It is not uncommon for a player to be eliminated from a round before he or she gets to take a turn. You may say, “Well, the game’s so short, what does it matter?” And while it’s true that the game rounds are short, it’s still no fun to sit out, especially if you made no mistakes and were eliminated by blind luck. Some may see this as the slings and arrows of outrageous fortune, the vicissitudes inherent in a sixteen-card game. I see this as a reason to play something else. The helpful player aids bring the total card count to 20. The final thing I didn’t care for about Love Letter is the small player count. The small-box size of the game, the speed with which it can be played, and the lighter nature of the gameplay make it ideally suited for a filler game. But a max of four players doesn’t make for a very useful filler game, at least in most of the situations I find myself in. While it’s true that there are occasionally only three of us waiting for others to show up, that number gradually increases as we wait for others to arrive. And then once they arrive, they want to jump in, and so on. The low player count for Love Letter puts it into a strange niche where I’m not sure of its utility. Enough of this. I’ve spent enough time writing about a game with sixteen cards. I don’t like Love Letter all that much, but there are lots of other people who do. (Judging by its current rank on BGG, I’m in the minority.) Are you likely to side with me or with them? Well, Love Letter is cheap (and in demand) enough that you could buy it and not be out much if you don’t like it. And if nothing else, it is diverting. Some have called it the “best light game ever,” and you might agree with that. For me, I’d much rather play Coup (another simple microgame short on components) or Chronicle (a meatier trick-taking game by the same designer that’s still short on components). Or most other games in the “Lenny” category. This game, as I understood, sit idly by until one night there were exactly four people who has just spent the day at a board game event, Boardgasm. We entre to unwind, but continue to play (as most board gamers do). This game fit that niche like a glove. It has its time and it’s place and that’s all I ask of a game. Great fun, but would be fit for the focus of a game gathering. I’m a little surprised (though, of course, I do think its one of the best light games ever). I found the bluffing element, and therefore the meaningful decision metric, to be much higher in my plays. I agree that luck can be swingy in any given round, but that’s why the game is played over several rounds Over the course of the game, I’ve found that bluffing and skill tend to triumph. I also really enjoy Coup, but Coup works best with gamers and gamers who like to lie. That isn’t everyone. Love Letter is enjoyed by even my non-gamer in-laws. I do agree that the whole “it’s just sixteen cards” thing is irrelevant. Either its a good game with sixteen cards or a bad one. The mere number of cards shouldn’t be a defense or an attack. I see your point that Coup probably is more of a gamer’s filler (especially since there are more things to keep track of). And there probably is some bluffing to be had in Love Letter. However, with the passive abilities in the game, there are several places where players simply cannot bluff (though I suppose they can try to be sneaky in the way they play). Still, not my bag. I’ll play it…but I’d almost certainly rather play something else. I actually find the blind luck element to be a bonus. While deductive reasoning and solid bluffing will swing the game in your favor over the long run, during the individual rounds even brand new players have a decent chance of earning a token. It’s hard to find that sweet spot of rewarding thoughtful play and still letting new or non-gamer players enjoy some victories along the way to keep them engaged. So, while I agree that your criticisms are valid, I would also claim that played as a filler between meatier games or over lunch with friends, they can be overlooked or even viewed as strengths. Just like how a slice of rich chocolate cake at the end of a meal is nice, but trying to eat an entire cake for dinner will just make you sick, you have to keep context and dosage in mind. That’s fair, and I get that. However, even in the “newbies can win” category, I think there are better games that offer more choice, or that are less obscure in hiding the lack of choice. Dexterity games, for example, are great at giving new players a chance, but the emphasis is on skill rather than choice–thus, it’s still interesting, even when not choice based. For Sale, Coloretto, and 6 Nimmt are all super simple games for new players to play, and new players have a chance at them because while player choices matter, the optimal route to victory isn’t always clear. To each their own, obviously. If Love Letter fills the non-gamer niche for you, that’s great. For me, I’d almost always choose something else. I disagree. You can build towards one of two strategies: kick everyone out or hold the highest card at the end of the round. Some choices are deterministic indeed, but not so many occur to call this game ‘meaningless’. There’s only 2% chance you draw this combination. It is indeed an extreme example. What other situations have led you to this conclusion? It sounds like you’re hoping for a brain burner with plenty of scoring options, complex mechanisms, dry & deep, scaling from 2-8 … Sorry to hear all this but I think your expectations are off. Perhaps you don’t like deduction or your group isn’t particularly good at it. This is a light and fast-paced game about deduction, interaction and a bit of bluffing which is very accessible to non-gamers, women in particular. It does what it does and it does well indeed.